Are you posting another market commentary on your social media? To be sure, posting financial content, in the form of your podcasts, market commentaries, and blogs will cement you as a thought leader in the digital landscape. But if you’re only posting industry-related content, your social media is missing something essential. A human touch. Social media posts that showcase your human side will help people relate and feel a connection to you and your firm. People who find you relatable are more likely to work with you. And clients who like you probably won’t leave for the advisor down the street. 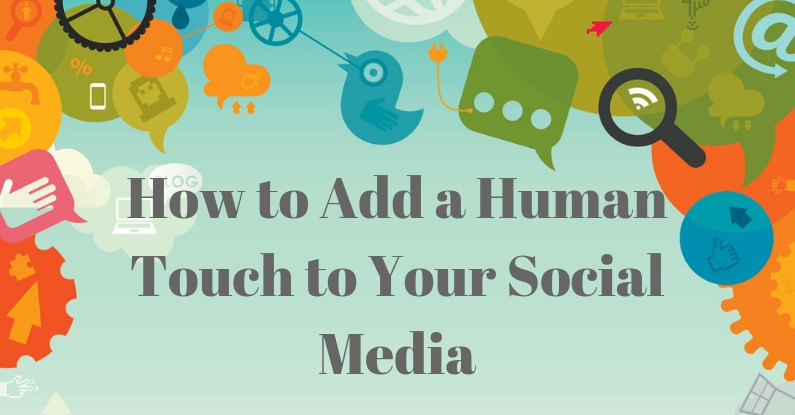 And did you know that personable posts attract engagement? Engagement refers to actions people take when they see your posts. This includes “likes,” “shares,” “comments,” and even just clicks on a post. Engagement is one of the many factors that social media algorithms take into account when they’re deciding who and how many people to show your posts to. In other words, engagement matters because it gets you more eyeballs on your posts. What is a human touch? We’re talking about posts that touch people on an emotional level. Of course, market commentaries could drum up feelings, but, remember, the goal here is to be relatable and show people that, hey, you’re human too! Let’s look at these ideas in action! 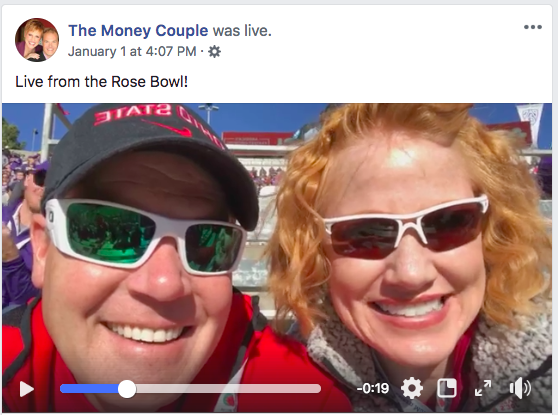 Meet Bethany and Scott Palmer, the energetic duo behind The Money Couple. 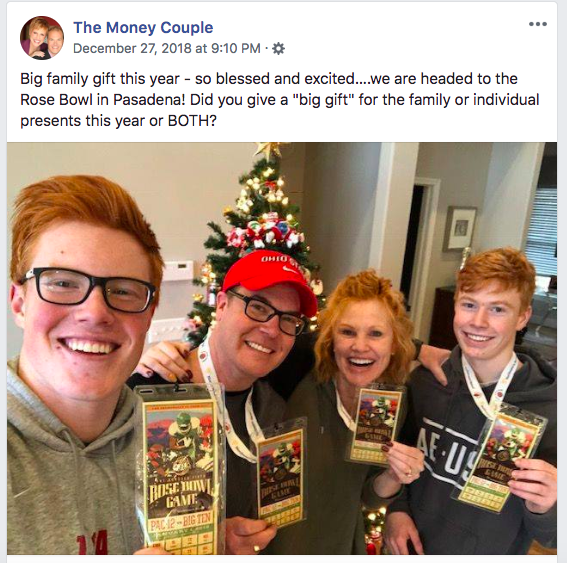 These two are on a nonstop mission to help couples strengthen (and even save) their marriages by learning about each other’s Money Personalities. During the holidays, Bethany and Scott shared a photo that burst with family-wide excitement. Family photos are usually a big hit on social media. Photos with you and your kids, in particular, show potential and current clients that you can relate to parent-life! Ask yourself: What upcoming activities can I post about? Do I have older photos that could be a #throwbackthursday? 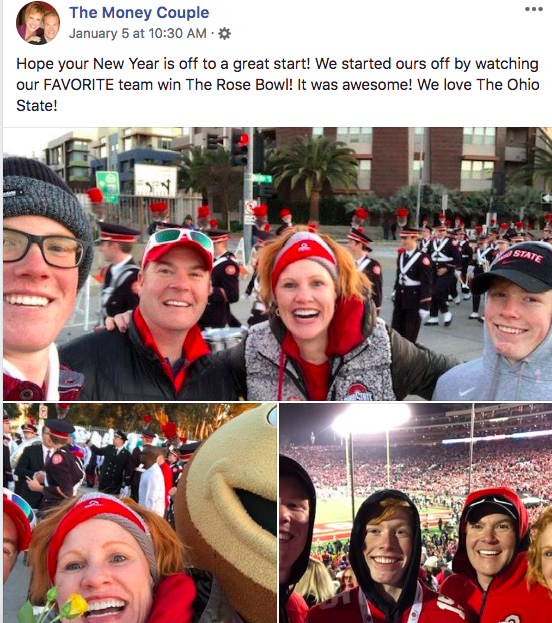 Then the couple took everyone along for their adventure by posting engaging photos and doing a Facebook Live from the Rose Bowl! With Facebook Lives, you can interact with your audience in real time. Consider using this in-the-moment communication for sharing stories, making announcements, broadcasting events, and doing a non-finance Q&A. The final snippet of the Palmer family’s outing came in the form of this spirited photo collage. The takeaway: you can involve future and current clients in your best memories by sharing photos and videos with them! We’ve been long time admirers of Diversified’s social media. Why? This financial planning team serves up plenty of blogs and stock market reviews on Facebook, but they’re definitely not afraid to show off their fun team culture! Here are some examples of how Diversified makes their social media pop with personality! 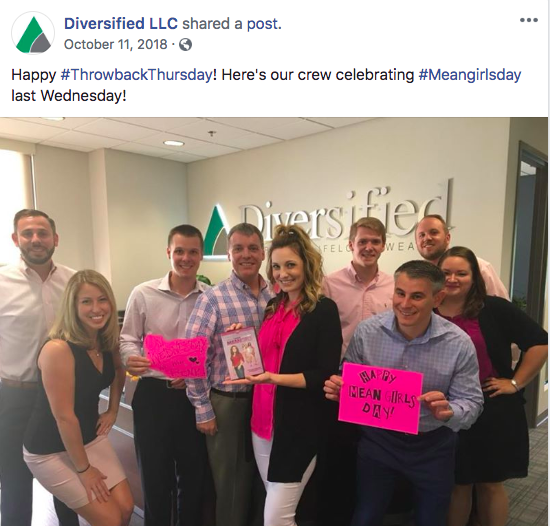 Take a casual scroll down Diversified’s Facebook page, and you’ll see scores of photos that celebrate holidays, team birthdays, and work anniversaries. We give these photos five stars for showing the people behind the firm—plus, these team-oriented photos are LinkedIn worthy, too! But we especially love this quirky photo of them getting in the spirit of National Mean Girls Day! Speaking of national days, have you considered adding them to your social media strategy? Diversified takes many opportunities to touch on current and potential clients’ interests by posting about national days, weeks, and months. 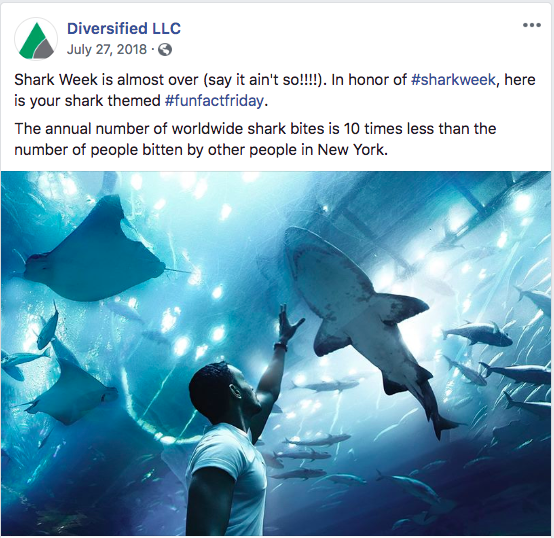 Here, they’ve shared a colorful post for shark week that features a fact. Download this national day calendar and start adding splashes of fun and interest to your social media! For free design resources, check out Unsplash for images and use Canva’s templates to customize your own designs. And I couldn’t resist showing you this post! 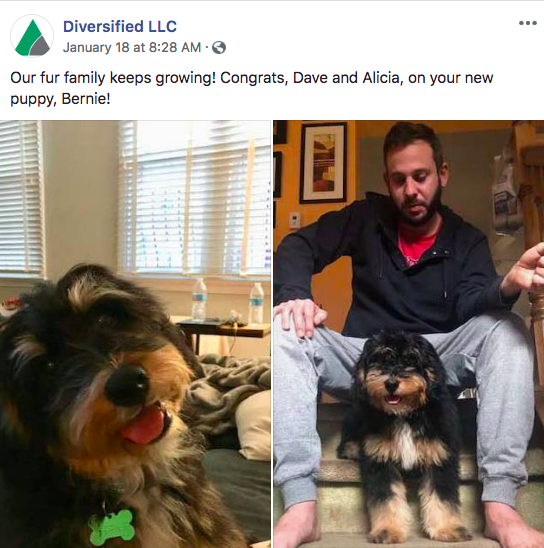 Diversified put their own spin on the convention of baby announcements by revealing a furry addition to an advisor’s family. In doing so, Diversified has endeared themselves to pet lovers and reminded their audience that financial advisors are people too. By now, you can see that there many different ways to add personality to your social media. This is your chance to be creative and, when in doubt, if you think an event is relatable and of interest to your clientele, post it!